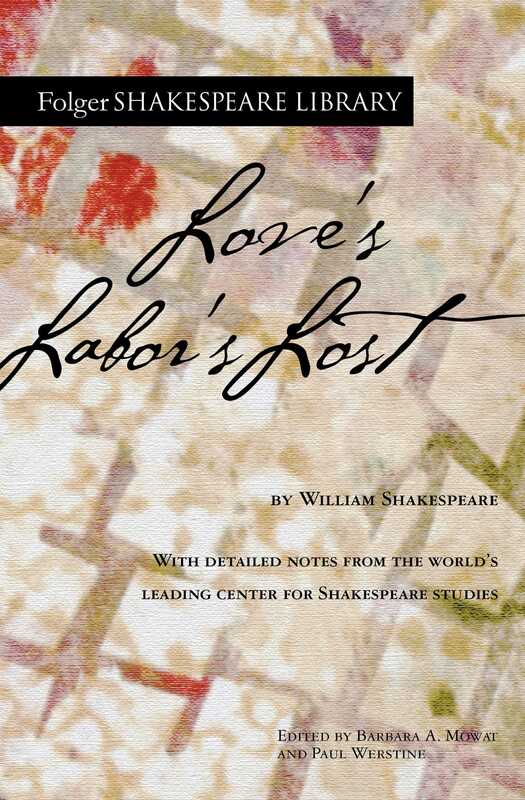 At first glance, Shakespeare’s early comedy Love’s Labor’s Lost simply entertains and amuses. Four young men (one of them a king) withdraw from the world for three years, taking an oath that they will have nothing to do with women. The King of Navarre soon learns, however, that the Princess of France and her ladies are about to arrive. Although he lodges them outside of his court, all four men fall in love with the ladies, abandoning their oaths and setting out to win their hands. The laughter triggered by this story is augmented by subplots involving a braggart soldier, a clever page, illiterate servants, a parson, a schoolmaster, and a constable so dull that he is named Dull. Letters and poems are misdelivered, confessions are overheard, entertainments are presented, and language is played with, and misused, by the ignorant and learned alike. At a deeper level, Love’s Labor’s Lost also teases the mind. The men begin with the premise that women either are seductresses or goddesses. The play soon makes it clear, however, that the reality of male-female relations is different. That women are not identical to men’s images of them is a common theme in Shakespeare’s plays. In Love’s Labor’s Lost it receives one of its most pressing examinations. William Shakespeare was born in April 1564 in the town of Stratford-upon-Avon, on England’s Avon River. When he was eighteen, he married Anne Hathaway. The couple had three children—an older daughter Susanna and twins, Judith and Hamnet. Hamnet, Shakespeare’s only son, died in childhood. The bulk of Shakespeare’s working life was spent in the theater world of London, where he established himself professionally by the early 1590s. He enjoyed success not only as a playwright and poet, but also as an actor and shareholder in an acting company. Although some think that sometime between 1610 and 1613 Shakespeare retired from the theater and returned home to Stratford, where he died in 1616, others believe that he may have continued to work in London until close to his death.